The publication date for the magazine is 1988. Wasteland is a richly detailed role-playing game set in the southwestern U.S. following a nuclear war early in the 21st century. Although it’s easy enough for beginners to play, the game is designed to offer plenty of depth and innovative game play for experts as well. 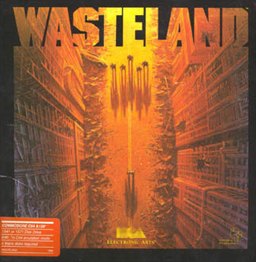 Wasteland was developed by Interplay Productions, the same group that created the popular Bard’s Tale adventure series. As in Bard’s Tale you create a party and set off on a quest or mission. But in Wasteland you’re facing a radioactive landscape full of mutants and other strange inhabitants. You carry pistols, rockets. Submachine guns, and laser weapons, and you develop your characters’ collective as well as individual skills. Along with the other Desert Rangers, your goal is to help rebuild civilization and stop the marauding mutants. So far it sounds familiar enough. But you’ll quickly discover that Wasteland has fascinating features. For one thing, it is a “permanent” fantasy world—changes and decisions you make stay that way. For one thing, if you use or destroy something, it won’t suddenly reappear later for your use. And the game’s world is so large that you can play all the way to the end and still not have seen many of the places that exist. Wasteland is designed so players can return to the world later and explore the areas they missed earlier. Hardware Requirements: IBM, Tandy, and compatibles; 256K minimum memory; EGA, CGA or Tandy 16 color graphics. Mouse optional. (There are three pictures with this preview. The first one shows a water scene, and the caption says: “You will need a high level swimming skill (5 or above) or a rope to cross the deadly curents that flow through the sewers of Las Vegas. The second one shows the chessboard maze in Blythe and says “If you conquer the Chessboard of Death in fewer than 30 steps you can reach the island of the Blood Priest. Lucky you. Behind the scenes fact: I, Ken St. Andre, was one of the lead designers of the original Wasteland game. Charmaine is the middle name of my daughter, Jillian Charmaine, and is not in there by accident. Oddly enough, Jillian grew up and married a Las Vegas man and now makes her home in Las Vegas—was that a bit of psychic prediction on my part, or just a coincidence? Jillian was 8 years old when we created the first Wasteland game, and the St. Andre family had no ties to Las Vegas at the time. The anonymous Electronic Arts PR guy who wrote this article had obviously never actually played Wasteland. Marauding mutants aren’t the real threat at all in Wasteland–some of the mutated wildlife do appear as hungry enemies to be overcome, but the real threat comes from the Sleeper Bases. Sigh.